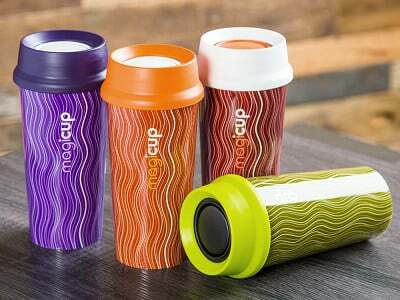 This anti-spill travel mug offers a better way to drink coffee (and other beverages), while keeping them safely in the cup. The magic of Magicup is its innovative lid. Your drink stays contained even if it’s bumped on the subway or jostled in the car. And the 360-degree drinking design lets you sip from anywhere around the lid. There’s no designated drinking hole—walk or drive without needing to look at the cup. If the cup gets knocked over, the lid’s center snaps shut almost instantly, preventing a major catastrophe. A splash may escape, but that’s it. Another benefit from the 360-degree lid is that it lets your coffee’s aroma reach your nose, heightening the flavor experience. The only thing we don’t recommend is tossing the cup in a bag. It isn’t designed for that kind of transport. But in your hands, on a table, or in the car, this cup cuts down on spills and creates a better way to enjoy your java. Hello, friends! 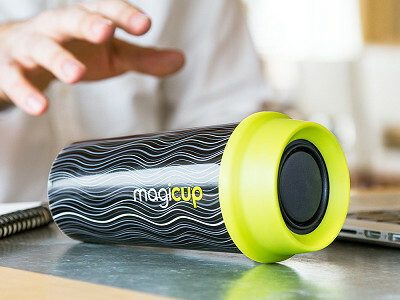 We're proud to introduce you to the Magicup—we've designed a cup that is open 360 degrees (so that you can smell, and therefore taste your drink!) and has anti-spill technology. Let us know if you have any questions for us! Are these microwavable and dishwasher safe? 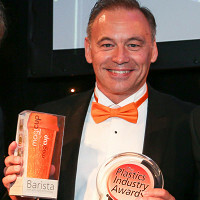 Hi, Magicup is top rack dishwasher safe however not suitable for microwave use. Can the cups be used by kids? @James Hi James, absolutely, children can use Magicup. We would suggest however, regardless of age that magicup's functionality is explained before they are let loose in the back of the car for example, on long journeys armed with full magicups! What kind of lining does the cup have? How long will it keep coffee hot? @Cindy Hi Cindy, magicup is lined with polypropylene, twin walled for extra insulation and will keep your beverage either hot or cold for 30-40 minutes, which we feel most people have finished their drink during this time. 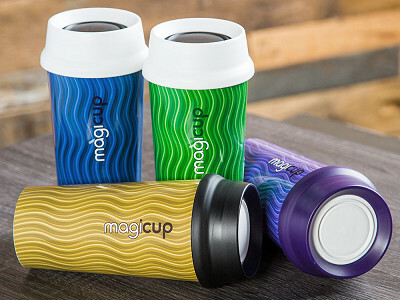 Magicup is a cup not a flask, and is designed to be used when filled rather than stowed and used at a later point. @paula Hi Paula, many thanks for the suggestion ! It is 16 oz. at the max, Jenifer. Is it good for cold beverages, too? Also, how much will it hold? @Mark Hi Mark, yes, magicup is suitable for both hot and cold beverages and can hold a maximum of 16oz. @Jenny It keeps Cold things cold, and hot things hot, How does it know? sorry . . . .very old joke. Where do you give the capacity of the cup? Don't just give it to me, please tell me where I missed it? It's making me crazy that I can't locate it and I know it has to be there somewhere! @Marlene After you click "buy" it is in the details section. Hi Marlene, you can find complete product details by clicking on any of the "buy" buttons underneath the video. I'll let you find it....or you can read one of my other responses. You beat me BY a nose, Harry! How Many Ozs does it hold? 16 oz. at the max, William. Are you planning on coming out with a 20 oz. or 24 oz. for us coffee aficionados? @Tom Hi Tom, eventually we would like to offer several different size options, however for now are concentrating on spreading the 'magicup word' and having as many people as possible used to our revolutionary new 'bi-stable valve' technology. These are along the line of Munchin Miracle 360 for babies and children. @Nancy Hi Nancy, I can see why you may think this however magicup works in quite a different way. 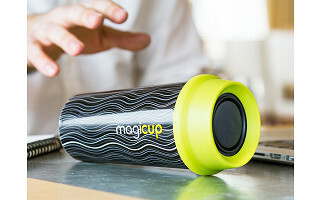 Magicup has been designed to provide a completely natural drinking experience.When it is tipped at a 90 degree angle the liquid inside will flow as though there was no lid at all, pouring with a nice regulated flow and absolutely no sucking action is required at all. The valve will only snap shut if there is an impending spill or accident. Is the lid easy to clean, is it dishwasher safe and can the cup be microwaved to re-heat drinks? thank you! @Julie Nevermind, I found my answer when I hit "buy"...thank you! For $28.95, I assume you get all 4 - correct. Hi Andy, no $28.95 is the cost of one Magicup. A BPA-free, anti-spill coffee mug with 360 degree drinkability, not to mention twin wall construction for insulation, comes at a price. But for how much use most folks get out of their travel mugs and the potential money you'll save in lack of spills, it will earn its value in no time. @Mike your pictures are misleading. They insinuate your buying four mugs. I understand it's a design thing but it's not very clear. Our apologies, Wade, we wanted to show off all of the great styles Magicup comes in and so we sorted by theme which just happen to come in groups of four. I was wondering what the inside of the cup is made of....is it BPA free if plastic, or is it metal or glass? @Diane Ah, now I see that it is BPA free! That is wonderful because I drink all day long. Great invention! Thank you. I understand that it is designed to let the liquid flow at a 90 degree angle. This is the same angle it would be at if it tipped over. How does it distinguish from normal drinking to being tipped over in a spill situation? @Veronica Hi Veronica, the impact of magicup being knocked over, even if gently and completely empty causes the valve to snap shut. Also, if magicup were to be jolted upwards while you were drinking for some reason, or tiled too fast, magicup again will recognize an impending accident and react by snapping shut. Perhaps the best way to thinking of magicup is 'it is like an air bag for your drink'. Just like an air bag does not get in in the way while you are driving but is there if you need it. Magicup's special bi-stable valve will not get in the way of your normal, natural drinking experience but will be there for you if an accident should strike ! I'd like to see a stainless steel lining. Is polypropylene plastic? @Anita would you consider making some with a handle for those whose hands don't grip so well? @Anita Hi Anita, polypropylene is indeed plastic and we have specifically chosen these materials for the main body of magicup to ensure it is light weight and truly a mobile cup for the mobile generation. @Jenny Hi Ruth, we are currently working on some stylish detachable handles and sleeves to accompany magicup as an accessory. One problem I have with to go cups is in the car. Go over a bump, and your coffee, which is vertical, spills a little. Will Magic Cup keep this from happening? @Andrew HI Andrew, great question and yes...magicup ABSOLUTLY performs in this particular situation. One of magicup's most popular uses is in the car as you do not need to take your eyes off the road to locate the small hole to drink from whilst driving. During initial testing we had lots of fun putting magicup to the test in different driving situations to see how it would handle rough surfaces, tight corners and the fateful speed humps!!! All of which magicup handles perfectly leaving your cup holder wells dry and not a sticky mess. @Jenny Hi Jenny. I prefer stainless steel over poly. Any chance you'll consider a stainless version? Or what about offering a "universal" lid since that's the actual product? @Jenny I'd like to see a stainless model, too. Why is the cup not microwave safe? If the lid is left off, would it be OK to microwave? @Beth HI Beth, if you just put the main body of magicup without the lid in the microwave this would be fine. Just definitely not the lid. I may have missed this detail, but is the cup BPA free? Thanks! Will it dispense chocolate milk? Hi Janet, unfortunately, it's not THAT magical. But it will help keep chocolate milk from spilling. @Janet K I didn't see answer for dispense choc. Milk? That's COCO or hot choc. Hi Diana, Magicup is not magical enough to dispense chocolate beverages, but it is magical enough to prevent chocolate beverages from spilling. $7.25 each is a little high, but if it lasts a "lifetime" or for many years, it's worth it. But, I would like to buy two rather than four. Can I get just two for $14.50? @William Hi William, no $28.95 is the cost of one Magicup. A BPA-free, anti-spill coffee mug with 360 degree drinkability, not to mention twin wall construction for insulation, comes at a price. But for how much use most folks get out of their travel mugs and the potential money you'll save in lack of spills, it will earn its value in no time. @Jenny Where are these made? Hi Mary, Magicup is made in the UK! Over 500, billion takeaway cups go into landfills each year. As they are all coated in wax to make them waterproof they are not recyclable and the lids certainly are not. 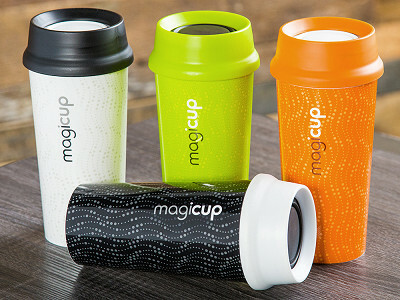 Not only is Magicup re-useable, lightweight and more portable than other travel cups on the market. The entire cup, including the lid can be chopped up, melted down and re-used. The market for this type of recyclable plastic is huge. Our slogan is, send it back to us, and we will recycle it for you!